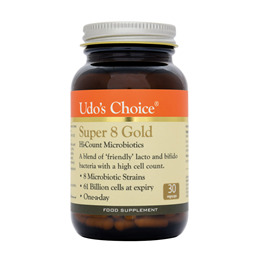 Udo`s Choice Super 8 Gold Microbiotics Blend is a powerful therapeutic formula of eight specific strains of friendly bacteria to help support a healthy balance in the intestines. This beneficial microbiotic is formulated for maximum lower bowel support in adults with sensitive digestive systems. 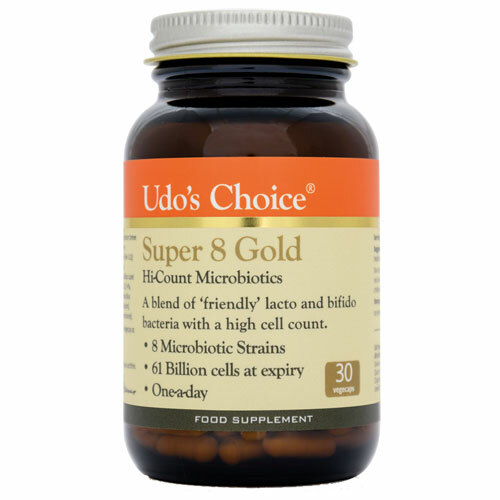 The Super 8 Gold is Udo`s Choice`s highest strength microbiotic and has the highest concentration of bifidobacteria for colon health out of all the Udo’s Choice microbiotics. Ideal for travel, the Super 8 Gold can be left unrefrigerated for short periods of time, making them convenient for holidays or business travel. Udo’s Choice Super 8 Gold Microbiotics Blend is especially important when travelling to foreign countries to support your beneficial microflora – it can help to combat foreign micro-organisms that may be in the food and water. Potato starch (carrier), Bifidobacterium breve (HA-129), Hydroxypropyl methyl cellulose (Vegetarian Capsule), Bifidobacterium bifidum (HA-132), Bifidobacterium longum (HA-135), Lactobacillus salivarius (HA-118), Lactobacillus casei (HA-108), Lactobacillus rhamnosus (HA-111), Lactobacillus acidophilus (HA-122), Lactobacillus plantarum (HA-119), Ascorbic acid (antioxidant), Stearic acid (emulsifier), Silicon dioxide (flow enhancer). Consume 1 vegicap before meals, or as directed by your health care practitioner. Store refrigerated at all times. We keep all our Udo’s Choice probiotic products in the freezer and send out frozen to ensure optimum activity when the product reaches you. Below are reviews of Udos Choice Super 8 Gold - 30 Vegicaps by bodykind customers. If you have tried this product we'd love to hear what you think so please leave a review. Works like Magic! I had digestive problems and it's now all gone thanks to these. Udo`s Choice Super 8 Gold Microbiotics Blend is a powerful therapeutic formula of eight specific strains of friendly bacteria. This beneficial microbiotic is formulated for maximum lower bowel support in adults with sensitive digestive systems.